Live to eat!!! 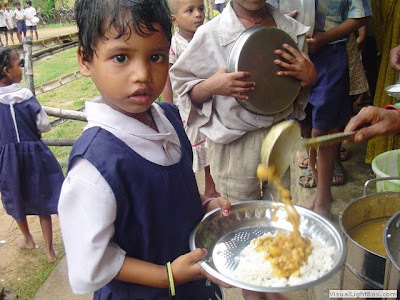 : Feed a child and save hunger! 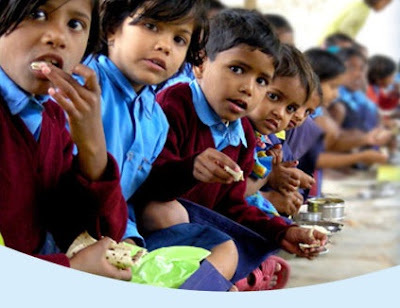 Feed a child and save hunger! During our darshin to the temple; one of the Iskcon representative came up to my Father and requested him to take some time off and explain to him about their new programme called mid-day meals for school children(that was the time when it first started in Bangalore). My father heard him out completely (now you have their website to tell you what exactly they are doing) and decided to contribute. Since then my father has been contributing in the name of the entire family. Mid-day meals today feed 120million children and is still growing.The food is prepared in extreme hygiene condition; with centralized and decentralized kitchen (cooking activity takes place in an area close to school and the best part is that the women who cook are cooking for their own children).They have two menu set in for South Indian meal - consisting of rice, sambar and curd and North Indian meal - consisting of roti, sabji and rice.For more information on decentralized kitchen click on the video below. Let us all take part and contribute in helping the children. great way of putting down things in exquisite manner. keep it up. Great job, will donate surely something.. This is a very important endeavor for these children. Great job! hey thanks for sharing this ! will try and help out in some way ! I just donated after writing on the same topic, your work makes me to adopt a habit to donate every month. Keep it up. Glad to see so many bloggers joining hands to feed the future souls of India! good post containing little more info than what people wud care to look for usually..
Namaste says Santa & a double treat!! !